Unhappy customers are more likely to tell people about a bad experience than happy customers are to talk about a good one. Ten years ago, this wasn’t so much of a problem for big business – If I had a bad experience with my bank, I would be able to tell a few people at work, and they would nod and reciprocate with their own horror stories. Now, I’m a bit more connected. If my bank pissed me off, it would go on the blog, on Facebook, on Twitter, on Linked In. If I was really annoyed about it, I might take the time to write a review at Review Centre or another site. Rather than 10 or 20 people knowing about my frustration with dealing with an employee in a call centre who was unable to do anything for me, a few thousand people would know. Also, my review might start showing up in the search results against the name of the bank, and could potentially put customers off joining them. I’m probably directly networked to around a thousand people, and when you add in the people who re-tweet, or like my comments on Facebook and share them with their friends, the number could be much higher. And I’m not the only one. The average Facebook user has around 190 friends. Bad news travels fast these days. One of the main reasons why social media is getting so much air time at the moment is because board directors at big corporations are getting an accurate picture of what their customers really think. In the past, sentiment would generally be captured via customer satisfaction surveys, but these typically fail badly because the questions are not structured well enough to get a good picture. Also, real statistics such as complaints or customer churn are difficult to measure in context. Banks, rail companies, and big retailers are understandably unwilling to divulge sensitive information about how badly they treat their customers. Sending a tweet in the heat of the moment is easy. 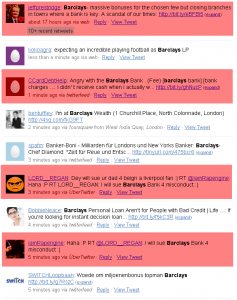 Too easy as far as companies like Barclays are concerned, as each of these tweets is indexed and searchable instantly. A single news story can generate a lot of feedback about a company. If you take the position that social media is the new customer feedback form, then you put yourself in a situation where you need to be able to do something useful with that information. I’ve said before that monitoring and measuring is an essential part of any process. There are plenty of options available for monitoring the social web. Radian6, Ubervu, MBuzz, Alterian. There is no excuse not to know what people are saying about your organisation. And once you know what they’re saying, you need to know what to do about it. Social Media is a two way channel – you can talk as well as listen, and participation is essential if you are going to make your customers happier – or at least understand why they are so upset. The most important thing to do is to have someone responsible for responding who actually has the power to make a difference. Customers are frustrated enough by the placating voice of a call centre worker who can’t do their job, having a similar person in charge of responding on Twitter is likely to do nothing to sort out their problems. Not every comment wants an answer, and it’s important to understand that. Sometimes, it’s better to say nothing than to stoke the fire. It takes judgement to know when to say something, and when to stay quiet, and the fact is that you won’t always get it right. Think about the person who is commenting, and look at their language. How angry are they? Do you think that you can talk them down? If the answer is no, then leave it. Consider how influential the person is. If it’s a Twitter account with no followers, or a blogger with no readers, then making a comment will probably just add fuel to the fire and draw attention to the problem. When you do respond, make sure that you respond decisively. Don’t put off the problem, and try and pull the attention away from whatever channel you are using. Contact the person making the comments, and find out what their problem is. Offer them a solution that meets their needs. If you’re only going to fob them off, don’t bother responding at all, you’ll only ever make things worse. There is no point in just responding and forgetting about what you’ve said. It’s vitally important to actually understand what is being done, and what the impact is. How many complaints are you handling, what is the nature of them, do they fall into categories, what can be done to improve the situation. Pro-activity is essential. If all you do with social media is respond to complaints without learning anything from them, you might as well throw money into a pit. Use the feedback as the basis for developing your product. If you can make your customers happier, they will be more likely to stay with you. If you take the easy option of just trying to bury the truth through a response strategy, rather than taking action to eradicate the causes of complaints, you will need to keep doing the job forever. If the common feedback is that your customer service is atrocious, take action to improve it. If your products are shoddy, make them better, if your hotel rooms are dirty, clean them. Treat social media response as a short term solution, and remember that the cost of retaining customers is generally lower than the cost of acquiring new ones – particularly if you have the challenge of a bad reputation to content with.